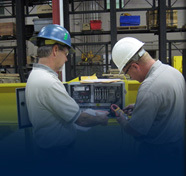 Since 1997, Cranewerks has been providing unique and innovative material handling solutions to industrial workers nationwide. We manufacture and service industrial bridge cranes, and we provide inspection services. Our dealers operate all across the United States and seek to surpass safety standards by providing weekly, monthly, and annual inspections for every single one of our clients. If you require an overhead traveling crane, or need us to come inspect it to ensure it is still doing a satisfactory job, we can provide affordable services. Although we have a network of manufacturers and dealers that reaches all across the nation, we also believe in the importance of maintaining a personal and close relationship with each of our clients. We are simultaneously small enough to provide immediate customer support and customized service, and large enough to encompass a wide range of services and skills. We employ expert manufacturers, and companies rely on us for everything from manufacturing, servicing, and inspecting. Customization is one of the most effective ways of ensuring that a company is satisfied with their overhead traveling crane. Having a customized product at their fingertips allows them to feel more in control. We provide cost-effective re-manufacturing services and customization so that you can get back to doing what you do best, instead of losing valuable working hours by trying to repair or re-manufacture a crane yourself. Problems arising from a damaged or malfunctioned bridge crane can be disastrous, both to your employees’ safety and your company’s productivity. At Cranewerks, we seek to eliminate unnecessary stress by providing 24/7 service to customers who need our assistance. No matter what type of help you might need, we always have a skilled manufacturer on hand to help you service your overhead traveling crane, or whichever type of bridge crane you might use. We have a long history of providing up-to-the-minute servicing, inspecting, and re-manufacturing assistance to customers during technical or sales crises. Since it is essential for companies to remain within the industry standards set forth by the OSHA, we are dedicated to ensure you can get back to work—safely, cheaply, and without hassle.